The Lighting Wattage Per Square Foot report includes the total wattage, total square feet, and wattage per square foot for each room, each floor, and finally for the project as a whole. This report is in square feet regardless of the drawing units. This report is generated completely from scratch for you--all you do is select it from our menu or Report Wizard and say GO. DraftLogic Electrical takes care of gathering the area of each room in the project, the total wattage for the lighting therein, and the description of the room. DraftLogic Electrical calculates the watts per ft2 and builds the report for you, providing a summary for each individual floor and finally for the project as a whole. The detailed reporting gathered for each individual space in your project will assist with any energy efficiency reporting the project requires, whether that be a building energy load calculation or specific watts per square foot reporting requirement. 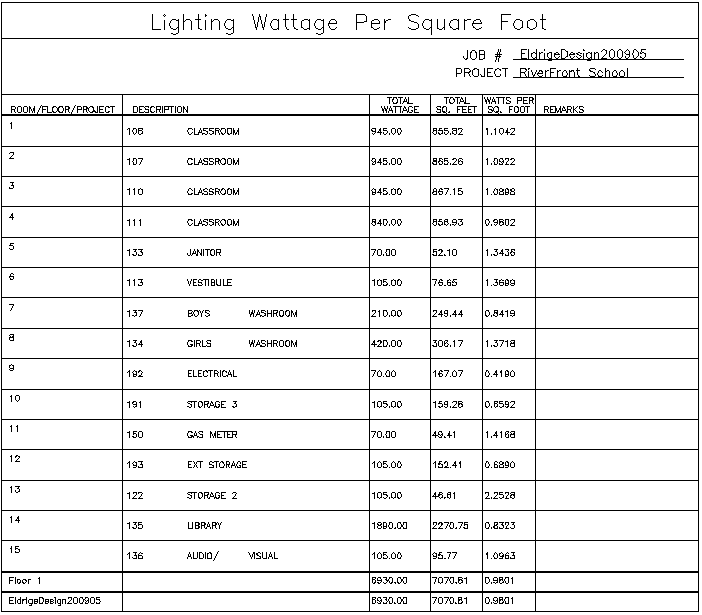 When automatically generating the Lighting Wattage Per Square Foot report, DraftLogic Electrical finds all the lights in each room, gets their wattages from the Luminaire Library database, locates the inner face room boundary to get the room area, and calculates the wattage per square foot. This saves you a number of calculations for each room, meaning hundreds in the typical size project. The Lighting Wattage per Square Foot Schedule reports exactly what is in the floor plan in seconds. Never any luminaires or wattages from them missed, never any numbers transposed, added, or divided incorrectly. Use the Lighting Wattage per Square Foot Schedule to demonstrate your compliance with client and government energy efficiency standards. The raw data will also be part of what you need for your building energy load calculations for LEED compliance. Lighting changes happening faster than you can flick a switch? No worries, the schedule takes almost no time to update. Rich in detail, the Lighting Wattage per Square Foot Schedule will be perceived as high value by your client, increasing the perceived value of your services. The schedule that is created uses standard AutoCAD blocks. This means you can scale, rotate, copy & paste, move, modify any values, and even save the Lighting Wattage per Square Foot Schedule out to its own DWG.